This winter (Nov 2011) me and my wife took refuge to the Himalayas for 5 days – a well earned vacation that was long overdue. She wanted to visit her old schools in the town of Kurseong in Darjeeling and I was more than happy to accompany her in the streets of Kurseong and Darjeeling and study the beautiful Darjeeling Himalayan Railway. Living in the same country and staying just 12 hour drive away from the hills, it has been a long time focus for me to build a proper layout on DHR, and I would like to build it in smaller scale, preferably in 1:120 to 1:160 range, rather than 1:87 (Still deciding since I need to study the feasibility of scratchbuiling working locos in that scale). I want to model not just the rolling stocks and locos, but the wonderful railway itself, along with it’s exciting and dramatic scenery, unique railway operations and most importantly portraying how this work of beauty has remained as the lifeline of an already difficult life in the hills of this state for nearly 150 years. In this trip, I took the opportunity to finish the first stage of “prototype study” for the project. This project is definitely 'projected' in future (Not less than 2-3 years) and not at all before I complete my Wrightsville Port Layout, but this is something that I will do in the coming days. I am just making my ground ready and sharing my study here, so that anybody interested in modeling DHR, or even just knowing about the specifics, can benefit from this research in the mean time. My study is focused only on the stretch between Kurseong and Darjeeling since the time when we visited DHR, operations from Siliguri to Kurseong had been stopped for over 18 months because of the damages caused due to landslides in 2010. I am not complaining much, since Kurseong to Darjeeling still gives a very exciting section of the DHR route, including Batasia Loop. Below, I will take step by step journey from Kurseong to Darjeeling with photos and videos. Hope you enjoy it, and if you decide to use them for building a DHR layout (no matter in which scale), I will be really happy if you let me know about the progress. 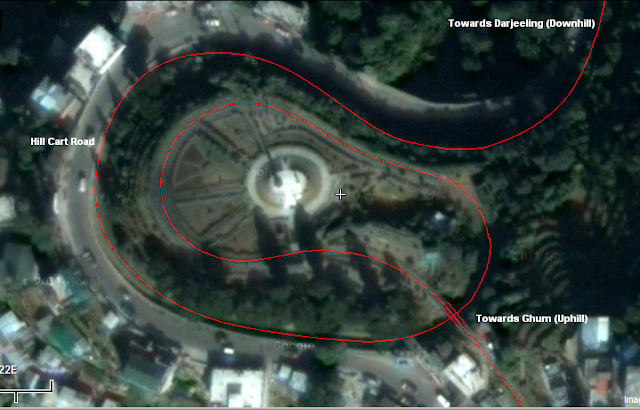 Kurseong is around 2/3 rd way up towards Darjeeling, 4864 ft. above sea level. The Kurseong station is off the mainline, like a yard and requires the trains to perform a revers action for the trains to access the station. There used to be an extension of the station on the mainline as well just before the Loco Shed (Along the Hill Cart Rd.) which primarily had a passing siding and a team track. This section is however long closed and the siding and team track is 80% under ground, with only a small section clearly visible before the loco shed turnout (As you can see in the pictures below). 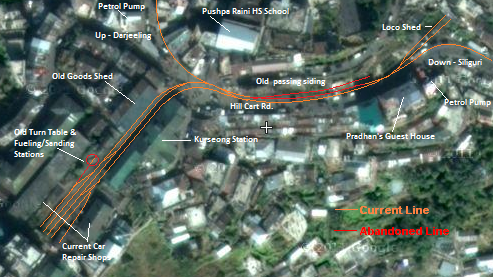 The plan of the Kurseong station (In fact most of the artifacts in DHR) is a treat to any railroad modeler, because DHR in real life faced the exact challenges a normal model railroader faces – tight spaces, tight curves, steeper grades… and that’s the reason you will see striking resemblance of a model railroad in DHR, in the plans of the stations, the way it follows the Hill Cart Road zig-zagging the same road every 50 or 100 meters like a shelf layout, and even a helix, i.e the Batasia Loop! In the pictures above, you can see the goods shed, dismantled turntable, the car repair shops, water and sand facilities, the run-around tracks and the station platform. Exiting from the station. Right goes downhill to Siliguri and left goes uphill to Sonada. The reverse section is on the right. After exiting the station, looking at the right (downhill to Siliguri), the big building is Pradhan's Guest House, first big building at the entrance of the town. The loco shed is just opposite of this building (not visible from the station) - we'll visit there soon. Looking at left, the Hill Cart Road entering the Kurseong town. The petrol pump is a unique one and can be an excellent piece to model. We will enter the town and walk along the rail line later. Now continuing downhill towards Pradhan's Guest House and the loco shed, first looking back at the station, then where the abandoned passing siding and team track used to be, and finally reaching the loco shed about 300 meters downhill. The loco is the NDM 6 diesel loco. Below, the loco from the various angles. You can also see the remains of the Class B type steam loco Queen of the Hills inside the shed in some of the photos. Our next objective was to document the Kurseong town through the Hill Cart Road and how the railway has become an integral part of the life in the hills over the last century. Another objective was to document authentic roadside structures that will be very helpful to create a visually compelling scene while building a DHR model. I believe building a model for this section of the railway will be very rewarding - you see a very nice balance of scenery and buildings, vibrant contrast in colours and most importantly how the railway blends into all the hustle-bustle of this small but busy hill town. The photographs are in sequential order of moving uphill towards the next DHR station Tong, the first photograph being taken just outside the station (in front of the above mentioned petrol pump) looking downhill. The series ends near the Government Tourist Lodge at the border of the town, where we stayed. The end of the line for DHR is Darjeeling, 6812 ft. above sea level. Well, I am writing about Darjeeling first before covering the highest point in the line, Ghum since we visited Darjeeling before Ghum. In fact, we took the train from Darjeeling to Ghum (and return)! When you enter the Darjeeling station, the road takes a sharp curve around a hilltop, and as soon as you negotiate it to reach the other side, you can get the long awaited glimpse of the Unicorns! The day we entered, the rather long steam engine facility had been housing 4 of DHR's invaluable 14 ton, B class saddle tank steam engines. We found 782 (Mountaineer) getting her final touch-ups before leading the 10:40 hrs. Joy Ride, and the 791 just finishing her breakfast with coal and water to start her day! She was the one who would take us to Ghum in 15:00 hrs Joy Ride. Though compared to the mainline steamers of the past, these locomotives were Lilliput, but just like any steam engine, you still witness that raw power in them - like wild horses - you smell the mixture of coke and oil, listen to the beautiful steam whistle and ride with the chugs that makes your heart beat in hypnotic rhythm. They once again reminded me of the fact that the human civilization might have come a long way in last 50 years or so, but the real beauty of human spirit lies with the bygone days! The excitement was such that I cannot help sharing the video first. Other than being one of my very few decent photograph, the last picture also serves the purpose to draw an approximate measurement of the locos, with my height being 5'10". Darjeeling also has a working manual Turn Table. Usage of this one is fast declining since Steam service is very rarely used for the whole stretch they can mostly manage 2-3 coaches in both front and reverse gear. 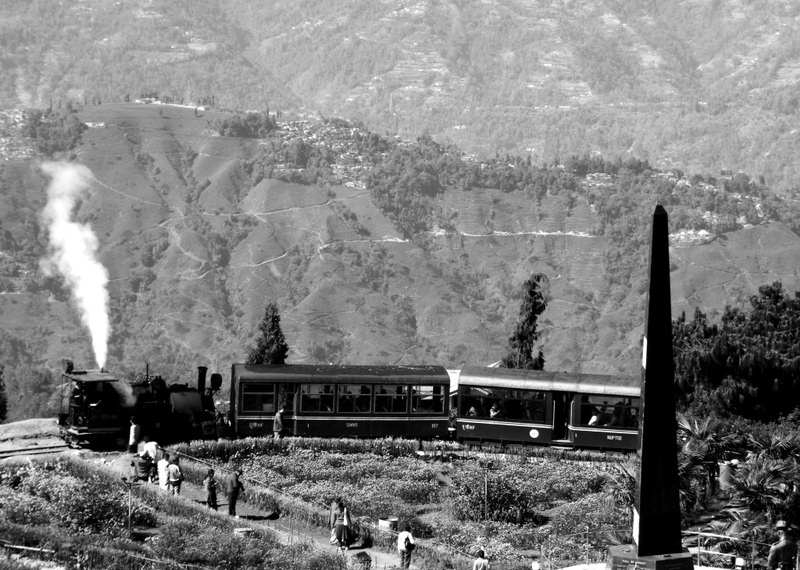 At the moment steam service is primarily used for the Joy Ride between Darjeeling and Ghum, and in some cases they lead passenger trains between Darjeeling and Kurseong stretch. water tanks can be spotted throughout the stretch of the DHR, some old abandoned ones and some newer active ones-sometimes side by side, giving an idea of how many generations these tiny little pieces of marvel served. The small open air museum adjacent to the station has some interesting artifacts. The smallest steam engine on DHR line, named Baby Sivok, goods wagons and flat cars from the goods hauling days. Goods hauling days of DHR - not too long ago! DHR B Class locomotive standing beside a Royal Scott. Overall size is smaller than the tender of Royal Scott! The last bit of prototype study is on Batasia loop, which can be a central piece of the model railroad, may be is a peninsula set-up. As mentioned before, this loop is very similar in design to a helix in model railroad and gives the train approximately 70 ft. of elevation (this is an absolute guestimate based on observation-haven't found any solid mathematics yet). This section is dedicated primarily to various shots of the steamers. I have also included a few shots of the 'Queen of the Hills' remains in Kurseong loco shed - can be an interesting detailing for a layout. Now, that brings me to end of the story, or should I say just part I of it! Yes, if this is just the prototype study, one can only imagine what it will be like to build it. This project will require one of the highest degree of scratchbuilding, starting from loco, rolling stock, buildings, scenery, even vehicles and even possibly human figures, because commercially available vehicles and human figures are not possible to be adapted to a very specific Indian, Hill station scene. Then there is the question of gauge. I can't really think of modeling this in 16mm scale which is the perfect scale for the prototype since that runs on a 32mm track which is too big for me, neither I would like to go for Sn2 (and I'm not in favor of larger scales anyway). Next closest thing is OO9 - 9mm gauge track which probably is the most acceptable choice considering both gauge and scale. But what I really want to do is to model this in 6mm gauge-which comes to 1:101. So my only option is 3mm scale-and guess what, that scale is extinct! Am I not lucky? Latest Updates: I recently discovered about a wonderful project in France to model DHR. Have a look: http://dhr.gemme.org/index2.htm. The website in in French, so I would suggest Google Chrome as the browser to translate the pages.